1. 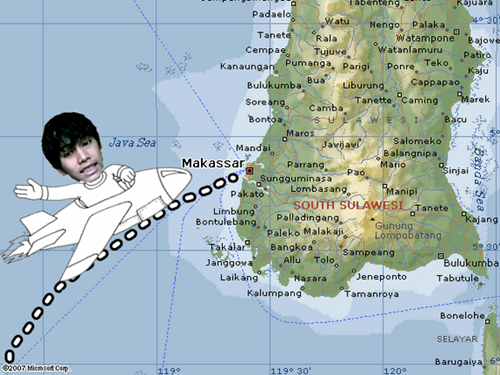 Have I told you that Mr Boyfriend flew to Makassar on the same day I went to Jakarta? You know some girls look prettier with their make up on. Well, I'm not one of them. I looked like a scary old lady who eats babies to stay alive. I guess I'll just stick with my eyeliner. I ordered this... thing. It was supposed to be a bowl of instant fried noodle with cheese, corned beef, and fried egg. But then it turned out to be a bowl of CHEESE with instant fried noodle, corned beef, and fried egg. 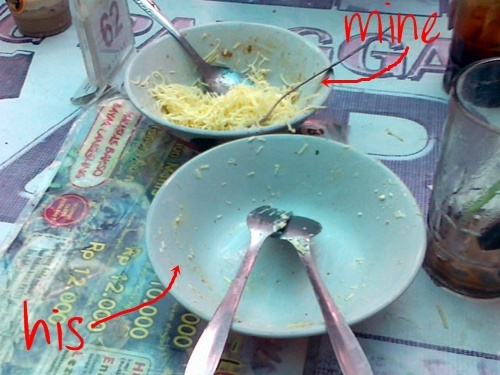 I still don't know how Afief managed to finish his meal.